IMPORTANT FACTS YOU SHOULD KNOW UTILIZING YOUR BILL PAY SYSTEM AT YOUR BANK TO REMIT ASSOCIATION DUES. THE USE OF BILL PAY SYSTEMS CONTINUES TO RISE HOWEVER, THERE ARE SOME FACTS YOU MAY NOT BE AWARE OF CONSEQUENTLY, WE HAVE OUTLINED SOME OF THE MOST COMMON MISTAKES MADE EXERCISING THIS PAYMENT FORM AND HOW YOU CAN AVOID RETURNED PAYMENTS AND EMBARASSING LATE NOTICES. 1. Physical checks are created and mailed at the time the funds are withdrawn from your account. Once this withdrawal is made and a check created, it can take up to 7 business days for it to reach our processing center. 2. 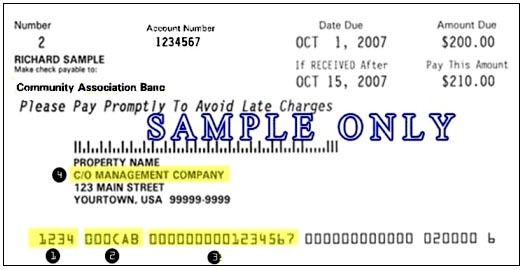 There are specific property codes and account numbers that are listed on your payment coupon that must be reflected on your bill payment check. Without these codes, our processing center will be unable to process your payment correctly resulting in the payment being returned. 3. Payments with insufficient property and homeowner account information will be returned within 24 hours of receipt to the bill pay provider. Please keep in mind that your bank may or may not be the issuer of the check. Many of the financial institutions in the US contract this service out and it may take several weeks to receive this credit back into your account. PLEASE REVIEW THE INFORMATION BELOW TO INSURE YOU INCLUDE ALL OF THE CORRECT PROPERTY AND ACCOUNT NUMBER INFORMATION FOR YOUR HOME. IF YOU MAKE PAYMENTS ON MULTIPLE PROPERTIES, PLEASE SEND SEPARATE PAYMENTS OUTLINING ALL OF THE CORRECT PROPERTY CODES AND ACCOUNT NUMBERS. EACH PROPERTY WE MANAGE IS ASSIGNED A SPECIFIC CODE AS WELL AS THE ASSIGNMENT OF AN ACCOUNT NUMBER FOR YOUR HOME. WE HAVE CREATED A SAMPLE COUPON AND OUTLINED WHERE THE PROPERTY CODE AND ACCOUNT NUMBER IS PRINTED ON YOUR COUPON. PLEASE USE YOUR COUPON INFORMATION TO COMPLETE YOUR BANK’S BILL PAYMENT PROCESS, ALLOWING US TO CREDIT YOUR PAYMENT CORRECTLY THE FIRST TIME. THANK YOU FOR TAKING THE TIME TO REVIEW THIS IMPORTANT INFORMATION AND INSURING YOUR BILL PAYMENT INFORMATION IS CORRECT. 2. Your account number should be entered as (Example) 1234-CAB-1234567. As in No. 1, 2, 3. 3. Set your payment to initiate 10 days prior to the due date. This will insure proper credit.